Practice directors of law firms are faced with the challenge of upgrading IT services to meet new demands of profitability and growth. As well, they are challenged by compliance with data security regulations and the increased use of mobile devices. Outsourcing managed IT services is a cost effective solution. 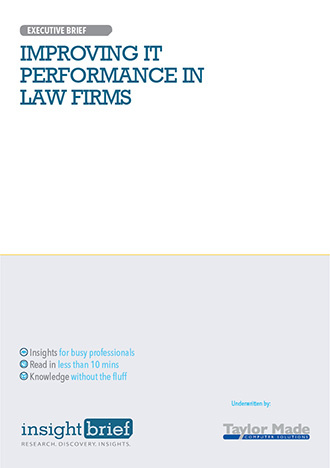 UK law firms spend 4.1% of revenue on IT. This is less than IT spending in many other business sectors. The legal profession lags in utilisation of technology. The revolution in the legal business through the use of mobile devices and apps is growing yearly. Worldwide, an average of 40% of lawyers use tablets. Law firm IT services must anticipate further use of mobile devices. Investing in outsourced managed IT services increases a firm’s operational efficiency by eliminating distractions, time and cost of managing an in-house IT infrastructure. Law firms, to protect their business and reputation, must be prepared for catastrophic business interruption. IT infrastructure must be in place to mitigate the effects of natural disasters, vandalism and data theft.